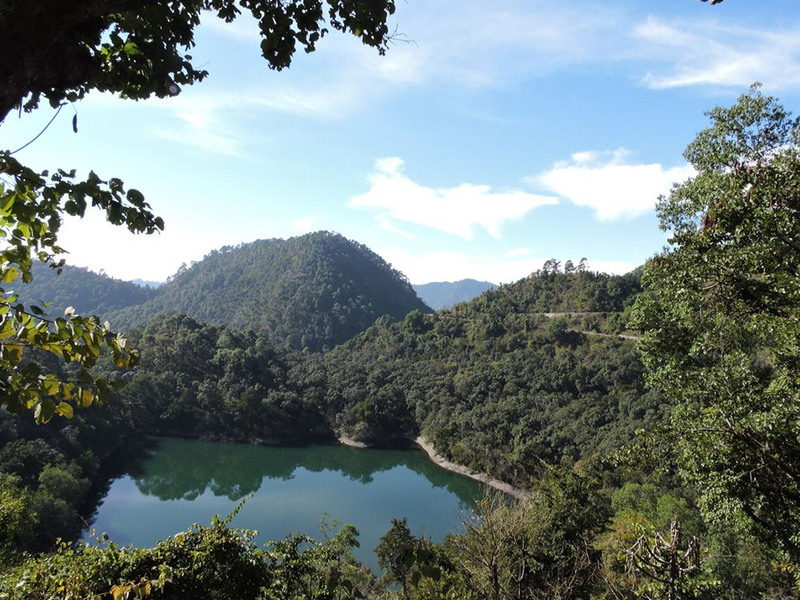 Sat Tal is a cluster of mysteriously inter-connected seven freshwater lakes located in the Nainital district of Kumaon region. Sat Tal is perched at an altitude of 1,370mts above sea level offering splendors of nature. The group of lakes is set amidst dense forests of oak and pine trees. Sattal is one of the few unspoiled and unpolluted fresh water biomes in India. The names of the seven lakes of Sattal are Purna Tal, Ram Tal, Sita tal, Laxman Tal, Nal Damyanti Tal, Sukh Tal and Garud Tal. Sattal is often compared with Westmore land of England by Britishers. These lakes are paradise for migratory birds as they stay for some time here during their migration. These birds try to escape the harsh cold of the great Himalayan region by migrating to lower areas of the Himalayas. If you are an avid birder and photography fantasize you then this is an ideal place for your holiday. The bedazzling Sattal meaning the ‘seven lakes’ is linked with a popular legend that is related with the epic Mahabharata. According to the famous mythology, King Nala drowned in the water of one of the seven lakes of Sattal with his wife Damayanti, during his fourteen years long exile given by his brother. Hence, the lake came to be known as Nal Damyanti Tal. The names of the other six lakes are Purna Tal, Laxman Tal, Sita Tal (named after the lead character of Ramayana), Sukha Tal and Garud Tal (named after the phoenix-like creature that carries the chariot of Lord Vishnu). It is situated at an elevation of 1,370mts above sea level on the road to Bhim Tal in the Nainital district of Uttarakhand state. It is located 22kms from Nainital with Kathgodam as its nearest Railway station. Sattal can be easily reached within 6-7 hrs of time. Sattal is a universal destination which can be visited anytime of the year. The weather during summer is salubrious and pleasant. You can see the diversified greenery during monsoon months at Sattal. Sattal is at its picturesque best during monsoon months.Carry heavy woolens with you if planning a visit to Sattal during winters as the temperature can fall as low as freezing point. What is Sattal famous for? Sattal is famous among tourist as Lake and Peaceful Location. Sattal is recommended destination for Corporates, Couples, Family and Kids, Foreigners, Groups, Solo. Sattal is popular destination for following activities/ interests - Boating, Emerging Destinations, Hill Station, Leisure, Weekend Getaway. Travelling to Sattal in 2019? Contact us for planning your Sattal tour with best travel packages of as per your requirements!